This 2 point premium harness kit combines some of the best components in a convenient, cost-effective bundle. From a luxury harness to kit bag, it offers excellent protection and plentiful comfort for working at height. What’s Included in the 2 Point Premium harness Kit? The most important aspect of this kit is the luxury harness, which is available in a range of sizes from small to XXL. It has shoulder straps and thigh straps that can be adjusted based on the dimensions of the wearer. The same goes for the chest strap, which has an easy to use buckle system. The rope lanyard is available in 1.5m and 1.8 metre lengths, with 35mm webbing providing plenty of shock-absorption. The positioning lanyard is two metres in length, comes with tough stitching around the fittings and a protective sleeve to prevent abrasions. 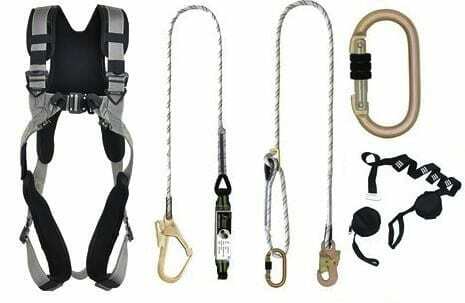 A suspension trauma relief strap is included to reduce problems caused in the event of a fall. Furthermore it does not limit the movement of the wearer in any way and can be added or removed quickly as necessary. All topped off with an inclusive rucksack, or a similarly practical carry bag, the 2 point premium kit ticks all the boxes. If you are working to a budget, our singe point restraint kit or standard 2 point scaffold kit will be solid alternatives. The Rope Services Direct experts can give you the lowdown on all of our kits, you just have to ask! Fill out the contact form or call us on 01384 78004 to get extra info and competitive quotes. 2 Point Premium Harness Kit Overall rating: 5 out of 5 based on 6 reviews.